Here I'll be taking a look at some of the folks at Communicore. No, not the old Future World pavilion; the links to some of my favorite Disney blogs! I hope to do this on a semi-regular basis as I visit the many blogs in the vast Disney blogosphere. I first caught wind of George Taylor as a guest on an old WDWRadio podcast, discussing Disney books, which happen to be a hobby of mine. George's site mostly covers Disney in print, but also covers other areas of interest. And Imaginerding's weekly Geek-End Update is a great gateway to other blogs of interest and a happy Saturday tradition for yours truly. George also contributes to 2719 Hyperion with partner in crime, Jeff Pepper, who I came to be a big fan of in the early years of WDWRadio. The site covers some great pieces of nostalgia and memorabilia from past Disney animation and theme parks, such as the recent entry on Disney's 1983 Annual Report. The aforementioned Geek-End Updated turned me on to this great site, which chronicles the design and construction of a scale railroad inspired by railroads at Disney theme parks and Knott's Berry Farm. An inspired and exciting project, to say the least. I guess I should be giving Lou Mongello some thanks here as the Main Street Gazette is run by another guest of his WDWRadio show! Ryan Wilson's been a recent regular on Lou's Wayback Machine segments (including a great one to 1986 which recently aired). Ryan's gazette is really cool and retro in design, and covers a lot of the same topics (and with the same respectful perspective) that I'm trying to do here. (Ryan is joined by Tony Caggiano, he of the The W.E.D. Page and the ever-changing Facebook photos!) Check out the recent feature on the Silver Creek at the Wilderness Lodge Resort. The Tikiman hosts an absolutely awesome resource to all things Polynesian (Resort), with news, trip reports, history and more. I really dig the format of the professional-looking website. Tikiman allows visitors like myself to take a trip back in time to the '80s, when I first visited Walt Disney World and began a run of three Polynesian stays. There is no shortage of books for anyone interested in the history of Pixar, including the excellent To Infinity and Beyond! The Story of Pixar Animation Studios, by Karen Paik, and The Pixar Touch, by David A. Price. The Pixar Touch takes a more objective approach to telling the history of the studio than To Infinity and Beyond!, which is a Pixar-sanctioned product. However the latter includes a great wealth of development sketches, photographs and cinematic stills, all in a wonderful coffee-table format. (The book was quite difficult to read in bed!) The book also designates its chapters specifically for each movie, technology, or other topic, whereas The Pixar Touch is completely chronological and includes movie development within the course of the historical context. One unfortunate: The Pixar Touch is very honest in its portrayal of Steve Jobs and some of his notorious tantrums in the early years, so much so that it takes a while to grasp the genius behind the man. But this thread is completely dropped in later chapters leaving the reader to wonder if Jobs ever improved his disposition and managerial techniques or if they remained volatile (as they are often noted in the press). There is a lot of overlap between the two books as many quotes from Lassetter, et. al. are referenced in both places. This is not so excessive that you feel like either book is unnecessary. In fact, the story has been told in enough different ways (DVD special features, interviews, etc.) that you’ll recognize many stories. Blame that repetition on the exposure Pixar’s filmmakers have had since Toy Story which allowed them to tell some of these familiar stories in other forums already. But there is still a large amount of great information covering those pre-Toy Story days that have only been told previously in smaller portions. They were long, lean days that really put the company's eventual success into serious perspective. I’d recommend both books for anyone looking to really dig behind the scenes, though you’re going to pay a lot less for The Pixar Touch than Infinity as the latter is a larger, more deluxe format. (That said, it’s going for a lot less these days.) If your attention runs in short spans like me, I’d suggest my approach, especially with Toy Story 3 looming this summer. A perfect time to go back through Pixar’s history! Disney has release the official trailer for Waking Sleeping Beauty, a documentary about the rise and fall of the Disney Animation Studios in the '80s and '90s, out of which came The Disney Renaissance and the animation boom that is still thriving in Hollywood today. The film is produced and directed by Don Hahn, the successful producer of such classics as Beauty and the Beast and The Lion King. A number of famous faces who cut their teeth in the Studios in the '80s pop up in the trailer below, including Tim Burton, John Lasseter, and Jeffrey Katzenberg. Hahn has seen a sort of second life at Disney as a historian of this period (as well as animation in general) so I anticipate this to be a quality documentary. Waking Sleeping Beauty, which has already shown to film festivals, will open wide in the Spring. On February 23rd, Captain EO will be returning to the Tomorrowland Theatre at Disneyland for a supposedly limited engagement. The famous 3D movie, starring the late Michael Jackson, produced by George Lucas and directed by Francis Ford Coppola, was a prominent part of both Disneyland's Tomorrowland and Epcot's Journey into Imagination pavilion in the late '80s and early '90s before being replaced by Honey, I Shrunk the Audience! Some have suggested that Jackson's notorious scandals were the impetus behind the replacement, though the relevance of both the cinematic quality of the film and Jackson's music almost certainly were a factor given how far or different both media had come in the mid to late '90s. Upon Jackson's death last year (The Tragedy of Captain EO), fans started clamoring for a rerelease of Jackson's most direct connection to Disney. There are currently no plans for the film to reopen at Epcot (or anywhere else at Walt Disney World). There is also no word yet on how long the run at Disneyland will be. Unfortunately this is one of the least appealing choices of attraction resurrection I could think of at a Disney theme park. "4-D" films like Mickey's PhilharMagic, Jim Henson's Muppet*Vision 3D, and It's Tough to be a Bug! all represent finer, more entertaining use of 3D technology that ultimately includes more timeless characters. And most fans I know would actually rather see Disney bring back Magic Journeys than EO! There's also a sense of catering to the cultural carnival that still surrounds Michael Jackson's death that makes this a little too inaccessible to a lot of people. On the other hand, it's a rare example of the company responding to overwhelming drive to bring back an old attraction. Too bad that old attraction wasn't Horizons! With all of the buzz lately about the impending launch of Disney's World of Color, the new hydrotechnic show opening at Disney's California Adventure this year (among the ongoing expansion at DCA), I thought it would be fun to take a look at a moment captured in the park's prior set up from this view, which can no longer be seen. It was a fairly-early February morning which cast the sunlight through the haze and illuminated Paradise Pier just like a scene on a Jersey boardwalk on a muggy July day. It was an interesting view of one of DCA's biggest sights, mostly because you could take the picture across the water without any tourist intruders in your photo! Ironically, Paradise Pier didn't do much for me but I could still respect its majesty. And while I dig this photo that I took, I ultimately believe the new show is one of Disney's best show ideas in a long time and much needed in the otherwise lonely lagoon. Los Lobos is probably not the first band you'd think of to do an album full of Disney tunes. The Grammy-winning rock group from Los Angeles, which has been together for over 30 years, is known for their mix of multiple styles of both American and Spanish music. And Disney always skews to their Disney Channel-brand acts for remakes from their songbook (see the DVD extra features of all their movies for living, putrid proof). But it's the sense of adventure with this inspired choice that separates the album from the safe, ho-hum effort it might have been with another act. Don't call Los Lobos Goes Disney a children's record. While some of these songs are essentially targeted towards children, the reality is that the original songs were universally beloved by adults and children alike. That said, this album goes a long way towards deconstructing why that is. Taken out of their often-epic original context, the listener is able to really see the craftsmanship behind the songs, which come from both movies and theme park rides. Los Lobos effectively picks their spots to integrate their varied mix of rock, blues, and country into a wide variety of classic tunes. They start off the album with a significant departure on the Spanish-sung, fired up "Heigh-Ho" and later on slow down "Zip-A-Dee-Doo-Dah" ever so slightly to give the song some interesting breathing room yet maintaing the song's whimsical optimism. On the other hand, they stay pretty faithful to famous theme park songs like The Haunted Mansion's "Grim Grinning Ghosts," which maintains it's creepy organ rhythm and haunted harmonizing, and stay tropical on "The Tiki, Tiki, Tiki Room." The band shines best on a pair of songs from Robin Hood, a surprising yet altogether inspired choice of a movie. The gentle "Not In Nottingham" and the rambling "Oo-De-Lally" show the beauty of the music from the oft-underappreciated film (at least to the more casual fan of animation) but also serve to show how effective the power of subtlety can be. They also do Louis Prima proud with a fun rendition of "I Wan'na Be Like You" (from The Jungle Book), which deftly combines traditional Spanish music with some African beats, tapping into the genre-bending talents of the veteran band. Any misconceptions of an overt Latin reinterpretation of Disney music are proudly defeated on the album. The band stays true to their own styles but also faithful to the varying sounds of the source material, which travel all over the map. The song selection shows a keen appreciation of a Disney songbook that goes deeper than most casual fans recognize. After a few listens, you'll be wondering when Los Lobos will be picked to provide music to a future Disney animated feature, because clearly they are showing how well they could! RECOMMENDED: For adult fans of the Disney songbook. For parents of little Disney fans who may be growing weary of the constant spins of the old soundtracks. And even just for fans of American and Mexican-infused roots rock. There is a lot of snow up here in New Jersey so it's nice to allow my mind to drift towards Disney's version of a hot African safari. This picture was obviously taken from the Kilimanjaro Safari ride at Disney's Animal Kingdom. It was the last day of our trip to Walt Disney World in 2005. Safari traffic caused our vehicle to stop right in front of this giraffe's shady resting spot. One of the many reasons why Animal Kingdom has become such a favorite destination within the World. I have previously mentioned my issues with transporting via bus at Walt Disney World. This isn’t an indictment of Disney itself but more of an issue I have with that mode of transportation while on vacation. Having spent my entire life just outside of New York City, I’ve either had to drive behind polluting buses commuting on the congested highways of New Jersey OR ride one of those very busses into Manhattan. To me, this is the mark of an urban existence and I’ve lived it in the epitome of urban America. So when I attempt to transport myself to a magical vacation destination, ideally I avoid all the typical trappings of the real world. And that includes the type of public transportation Walt himself was trying to avoid. Unfortunately, this now stands out as my most prominent experience with the Disney's Caribbean Beach Resort. My family and I visited this resort not long after it first opened. It was our first experience in a hotel outside of the monorail loop. After four such trips, we were clearly spoiled by the monorail as solitary mode of transportation. Now with a new hotel and a third park (Disney-MGM Studios) off the loop, not to mention Typhoon Lagoon and Pleasure Island, there was no escaping the bus as a necessity for travelling around the World. My recollections of that first trip to Caribbean Beach Resort are fairly vague as I just sort of went with the flow, still an awe struck teen eager to revisit all my favorites. However, 14 years later I returned with friends, intent on staying at a moderate resort to keep costs down. I had remembered the theme of the resort as colorful and original to WDW and despite my hopes to go elsewhere, I went in with fresh expectations. It seems these larger, sectional resorts like Caribbean Beach Resort and Coronado Springs tend to be more problematic with bus transportation as the guests not only must deal with the bus’s arrival at the actual resort, but its loop around to all of the stations. This can make for incredibly lengthy waits in a slightly average-themed bus depot, typically in sweltering heat. Perhaps I’m spoiled by all of those monorail-centric trips of my youth, but if I’m about to spend my day in a theme park waiting on lines, it’s pretty difficult to stand at a bus stop essentially waiting on a line just to even get to the front gate of said theme park. The rooms are fairly standard sized, with the typical amenities. Many visitors are just looking for a bed, a toilet and a shower as they spend most of their time taking in the theme parks, water parks or Downtown Disney. But if you do want that extra pizzazz in (or just outside of) your hotel room, this probably isn’t the place. Though admittedly the resort has recently added Pirates of the Caribbean and Finding Nemo-themed rooms. The designs are subtle but would probably dazzle the minds of young children. Thankfully you don’t have to worry about being pilfered in the middle of the night by drunken buccaneers! The Caribbean Beach Resort's marketplace eatery ended up becoming the template for similar locations at the subsequent moderate and value resorts, and it’s one of the lazier ideas that Disney has instituted at its resorts. This cookie-cutter Imagineering goes against the foundations they laid down at the Contemporary, Polynesian and Grand Floridian Resorts. Unfortunately now you have to pay Deluxe prices just to get the higher-end theming and dining variety that used to be the standard of the resorts. Granted, I understand that a large segment of America is looking for that quick, easy bite to eat and might point towards the multitude of finer dining options throughout the whole of Walt Disney World but I truly feel it does so at the cost of a wonderful opportunity to actually present more compelling Caribbean-themed dishes. One night we decided to dine on the premises instead of venturing to a theme park eatery which turned out to be as fairly a bland experience as most of the other experiences at the resort. Shutters at Old Port Royale isn’t magnificently themed and the dining area felt very constricted and plain. The food wasn’t much of an upgrade over the options in the food court. Sadly, my entire party had all felt some regret for not having been more creative with our dining choice that night. Unfortunately, convenience won out over creativity and meant one less country in World Showcase to enjoy a meal at! And that really is my issue in a nutshell with the Caribbean Beach Resort. It’s a nice place, located relatively close to Epcot, the Studios and Downtown Disney. And as only one of three moderate resorts, it’s priced within an atmosphere that most can afford and consider over the pricier deluxe resorts. It appeals to the convenience and affordability that many visitors are looking for in a trip, particularly those visitors with larger families. But in the process, a lot of the creativity that made the first three WDW (and many later) resorts so popular seems to have gone by the wayside. And with the transportation situation putting you at such a disadvantage, the theming isn’t exciting enough to make this an ideal destination. As I plan my next trip to the resort, I know one thing for certain…I will stay in an Epcot resort or on the monorail loop so that I could reduce my reliance on busses significantly and experience the magic not only the way it was intended by the man behind the magic, but also the way we all once felt that magic before the greater expansion. If pricing is still an issue, consider staying at one of the lodges (Animal Kingdom or Wilderness) in a value season as they are not as highly priced as other Deluxe resorts yet contain high quality amenities. Wilderness Lodge also gives you the benefit of boat transportation to the Magic Kingdom and the Ticket and Transportation Center (where you can get a monorail to Epcot). Also, consider how much time you might save altogether by avoiding a resort so dependent on busses. You might subtract a day from a Deluxe stay in much closer vicinity to the theme parks and still see the same amount of attractions! In the second part of a two-part feature on Main Street, U.S.A., we take a look at how that concept influenced other Disney theme parks, and which parks deviated from the concept completely. When Walt Disney and his Imagineers created the ultimate blueprint for what would become Disneyland, the concept that was front and center in the park was Main Street, U.S.A. The turn-of-the-19th-century-themed Main Street would not only show-off Disney’s ability to craft nostalgic architecture but it would also revolutionize the theme park concept. Because of the hub-and-spoke design of the park, guests could choose to skip a certain land, but short of hopping right on the Disneyland Railroad (or eventually escaping to the Disneyland Hotel via monorail), it was near impossible to avoid Main Street, U.S.A. as both the first and last sights of your day at the park. It helped transport guests from a realistic (albeit historical) concept into “the world of yesterday, tomorrow and fantasy” and subsequently back home. When Walt Disney World was planned, there was no doubt that Main Street, U.S.A. would once again bring guests to the hub and beyond. But enough success and attendance on both coasts would eventually bring the need and want for new parks and in the next 30 years, Disney would open four more parks domestically, each with a varied or drastically different theme than their flagship kingdoms. Would the company replicate the concept of the main thoroughfare to a hub? Yes, and No. Upon entering Epcot, Spaceship Earth acts as your portal to both the world of the future and the cultures of yesterday and today. So instead of building up to the reveal of a castle and the lands beyond through subtle transitions and sly imagery, Epcot puts its “wienie” (and a top signature attraction) at the fore of the park, holding nothing back and showing everyone how different this experience will be. To reach the other attractions within Future World, one must walk to either side of the Spaceship Earth entrance, filtering into the plaza between Innoventions. And just like that, you’re in the Future World hub. Go left for the logical side of the brain, go right for the creative side or keep moving forward onto World Showcase. Innoventions is hardly a Main Street concept visually but within its walls, it does act in very much the same capacity, harboring both quick eateries and gift shops like those main thoroughfares in Disneyland and WDW. And just like those parks today, the intent is that upon your exit, the allure of merchandise pulls you in from the street. Of course, much like Main Street, U.S.A., Innoventions also holds its own exhibits. But as a thoroughfare, it’s a completely different concept. It literally is the core of Future World and is thus passed through more frequently than Main Street, U.S.A. The design of the area lends itself to the circularity of Future World with Spaceship Earth as a sphere, Innoventions’ rounded outer walls, and the layout of the attractions and landscaping. (World Showcase itself is an extension, another circular layout though with a body of water at its “hub”.) Though ultimately, Future World was designed to be more of a free-form experience, allowing for wandering and zig-zagging. Thus, it’s not reliant on a thoroughfare to bring guests to a reveal or lands beyond. As such, Innoventions is often skipped by time-restricted guests. Even if you never walk into a Main Street, U.S.A. shop, it’s an experience you are incapable of skipping. Ironically, or perhaps intentionally, Epcot still does contain Main Street ideology, just without the U.S.A. suffix. World Showcase includes many countries that contain recreations of their historical town architecture via streets and squares, many of which had varying influence on the main streets that would eventually permeate Middle America. The visual concept of these streets and squares isn’t always the same as they don’t lead to many major unveilings and typically just dead-end. But the theory still prevails as you will find eateries, shops and even movies or rides within the meticulously-detailed architecture. Some of the best examples of street theming are the United Kingdom and France pavilions, with Germany and Italy offering more of a town square concept, and Mexico and Morocco imitating the winding open-air markets of their native lands. Unlike Epcot, Disney’s Hollywood Studios sticks more closely to the Main Street, U.S.A. format with its own street upon entering the park. This time though guests walk down Hollywood Boulevard, modeled after architectural elements of early Hollywood. And at the end of the street is every actor’s castle, a movie theater. Specifically, Grauman's Chinese Theater. Unfortunately, a giant sorcerer’s hat now clogs up DHS’s hub and out-wienies Grauman! Hollywood Boulevard contains the Main Street-esque theming, with street performers, well-detailed storytelling architecture, conceptually-similar shops, and even various tributes to Imagineers in the windows above! Beyond that architecture are some fairly generic shops with a Studios slant to the merchandise contained within. Though Sid Cahuenga’s One-of-a-Kind is one particularly unique stop along the boulevard, with a more Hollywood-centric focus to its memorabilia. With the opening Sunset Boulevard a few years after the park’s premiere, DHS had a second street that actually runs much longer with more points of interest and an even greater wienie waiting at its end, the Twilight Zone Tower of Terror. Like Hollywood Boulevard, Sunset Boulevard recreates famous architecture but this time from the '40s. But it also contains a few notable shops like Sunset Club Couture where a Disney artist is available to customize character watches on the premises. Once Upon a Time, replicating the famous Carthay Circle Theatre which once premiered Snow White and the Seven Dwarves, also has a Disney artist on hand for sketching and customizing your favorite character. (The shop specializes in household items.) Again, most of the other shops are the fairly generic souvenir stops found throughout the parks. Disney’s Hollywood Studios is actually the most street-centric of the theme parks, carrying the Main Street theme through the aforementioned immediate sections of the park and technically extending to Pixar Place, Commissary Lane, and Streets of America. In fact, the Echo Lake area is really the only free-form section of the park not contained to straight alleyways. Though these streets aren’t conceptualized like Main Street and really are meant more to emulate the nature of film studios than anything else. That said, with attractions, shops and eateries lining some of these lanes, a guest gets a similar vibe throughout their visit to the Studios. While Animal Kingdom takes the hub-and-spoke model to its ultimate extreme, it completely eschews the concept of a straight thoroughfare to its core. Upon entering the park and passing the ubiquitous guest relations quarters, the guests immediately submerge into the thick of Animal Kingdom’s jungle theming, traversing meandering paths until they emerge within view of the Tree of Life. From the Tree of Life’s Discovery Island home, guests are on the ultimate Disney hub with spokes that cross over bridges to the main land surrounding Discover River. On the other side of each of those bridges are the lands of Animal Kingdom. It’s a nice twist on the balanced circularity of Disneyland and the Magic Kingdom, with enough ingenuity to make Animal Kingdom’s layout one of Disney’s most innovative and refreshing. Unlike Disneyland and the Magic Kingdom where Imagineers expertly transitioned between lands in a gradual, subtle manner, Animal Kingdom’s lands are set apart from each other and utilize natural elements to distance the lands. After all, you don't want a dinosaur looming too closely to Asia! As for those roads most travelled, while there may not be a main street amongst them, both Africa and Asia are successfully themed to emulate the architecture of the native lands, including shops and eateries designed like markets and villages. Kudos for Animal Kingdom for taking its guests to its core in an aesthetic way that is true to the park’s theme. After all, it is the ANIMAL kingdom so theoretically we’re walking along their idea of a main street. Disney’s California Adventure had the unfortunate restriction of being the first park since Disneyland to open in a space constrained by very specific borders. (The park had to fit within the space of Disneyland’s parking lot.) This meant that the layout couldn’t really warrant more evenly-distributed positioning of the park’s various lands. And by balancing the park’s entrance with Disneyland’s across the way, any main thoroughfare upon entering would have had one of the park’s shortest lengths to contend with leaving little room for a significant hub or anything spectacular at the end. After entering through the gates and passing the various guest relations areas, guests pass under the Golden Gate Bridge replica and are immediately in Sunshine Plaza, DCA’s pseudo-hub. On the nearest outskirts of the hub are some California-themed shops and a pair of eateries (Baker’s Field Bakery and Bur-r-r Bank Ice Cream) but before long you’re thrust into the other lands of the park. Needless to say, Sunshine Plaza is Disney’s weakest central “hub” and DCA’s main entrance street its weakest thoroughfare. Some of the theming is actually pretty neat and I think the California-themed music playing in the area is a great touch but the unspectacular entrance is incredibly substandard for a Disney park. This is an example of the antithesis to the Main Street concept which is all about building anticipation and pulling the curtain back slowly; here, there isn’t much to prevent you from making a sharp right and hurrying to Soarin’. The Backlot section of the park, immediately to your left upon entering is an homage to DHS’s Hollywood Boulevard with its own shops, eateries and attractions lining the streets. The road takes a few sharp turns for bigger attractions, with the Twilight Zone Tower of Terror standing tall at the end of one of those turns. The Tower of Terror is one of many of DCA’s prime attractions that reside in this relatively smaller area. While this makes for great maneuvering from ride to ride, there is only one-way in and out of this area of the park currently (this is expected to change). Perhaps Imagineers chose not to put this concept at the front and center of the park for fear it would emulate DHS too closely. However it is for all intents and purposes DCA’s main street, it’s just not one you can take in and out of the park! Currently, DCA is undergoing construction to expand and strengthen its rather limited offerings and one of the key elements of this rehab is the reconstituting of the park’s entrance, both architecturally and structurally. With the entrance gates moving further into the outside plaza, the reconfiguration of the monorail bridge, and the straightening of the entrance thoroughfare, not to mention a more visually-appealing and historically-relevant Carthay Circle-designed “wienie”, Imagineers are aiming for a better themed introduction to the much-maligned park. Upon its completion, the thoroughfare will more closely resemble the park’s closest cousin, Disney’s Hollywood Studios, though with a greater focus on Walt Disney’s personal relevance in Hollywood. The folks at Disney have done a nice job treading the line between maintaining a smart concept and making innovative departures from that concept when justified. It would not have served them creatively if all six domestic theme parks had the same exact concept, even if thematically different. DCA shows us an example of a park that needed that creative spark while Epcot shows us that if you're going to throw the concept out the door, do it with style! Epcot (along with Animal Kingdom) also show us that the new kids on the block, relatively speaking, can also go a long way towards putting their own indelible stamp on theme park design and culture. But at the end of the day, there is no finer opening credits to a living motion picture than that of Main Street, U.S.A. In the first a two-part feature, the Mickey Mouse Watchtower takes a look at Main Street, U.S.A. on both coasts of America, investigating the similarities and differences of our first views of Disneyland and WDW's Magic Kingdom! Later in the week, we'll take a look at the influence of the Main Street, U.S.A. layout on Disney's other theme parks. Main Street, U.S.A. is one of the more fascinating areas of the Disney theme parks to analyze mostly because of how their historical relevance appeals to the various generations of the guests visiting, especially as those younger generations move into different age brackets. For me, there is still nostalgia for this “land” as the first experience I ever had at a Disney theme park, and essentially being the first experience we ALWAYS have at the Magic Kingdom. It was the setting for sun-addled daytime parades and dazzling nighttime Electrical Parades. I can still taste the ice cream of an afternoon retreat to Main Street. But I think back then I did take it for granted. It was a thoroughfare to more interesting worlds of adventure and fantasy beyond. I think the concept is universally recognizable but it takes a more astute and wiser person to truly acknowledge the magnitude of Main Street, U.S.A’s relevance, both historically and architecturally. For many guests, there’s still an aspect of taking it for granted whether we returned as young adults, full-sized adults (and then some, after that ice cream) or eventually bringing our own kids. With so much to see now and so much expense to capitalize on, it’s difficult to linger in what has essentially become a shopping area (particularly at Walt Disney World). It’s not as direct of an appreciation for many. But you’d be hard pressed to look back on any vacation to Disneyland or the Magic Kingdom and not recognize Main Street, U.S.A. as the setting of some important memory, whether it be fireworks, parade, silly photograph or just the pure joy of that first arrival. And when you dare to take a look closer and to immerse yourself in the land, it’s easy for even the most cynical person to consider not only the absolute brilliance of Walt’s concept but the magic of how that concept can subtly permeate your memories. There’s obviously a historical aspect of Disneyland’s Main Street, U.S.A. that trumps the Magic Kingdom by simple virtue of being the park that Walt walked through for 11 years. Disneyland’s even includes a much-revered apartment that Walt kept above the firehouse! I’m not one to base comparisons of the kingdoms on the persnickety notion that Disneyland will always be superior because Walt walked through it. But I do have to say, it adds something, even subconsciously, when you’re there, particularly for those who only know the Magic Kingdom. Sure, there are many thrill-seekers who skip past any love of Walt for the pure thrill of it all. But for the most part, fans of Disneyland and Walt Disney World have an immense respect for Walt himself. So making the pilgrimage to his first park adds a certain emotional reverence to the experience. One thing that competitors tend to dwell on is how largely the castle looms beyond Main Street, U.S.A. Magic Kingdom’s adaptation is obviously more regal as Cinderella’s Castle stands taller and is treated with more iconic reverence. Disneyland’s Sleeping Beauty Castle isn’t as majestic but is the centerpiece of a more quaint approach to the layout of the land. The castles have their obvious design differences that go beyond size as they simple are two different architectural marvels. When I first visited Disneyland, I expected to be disappointed by this, but much like the street leading up to it, one needs to look beyond size and respect the majesty of the concept and creation. Plus, Sleeping Beauty’s Castle has a certain charm that works almost as effectively as Cinderella’s epic majesty, especially when you see how much more effectively it opens up into the Fantasyland behind it than the Magic Kingdom. The exterior architecture isn’t as disparate as the interior layout of the two Main Streets. 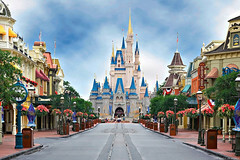 Walt Disney World’s is larger and roomier, pointing towards an obviously larger central park icon. It also includes design elements that points towards more eastern, Victorian influence and nods to the Industrial Revolution. But ultimately, guests are meant to enjoy the charm and quaintness of a small town main street and because of that, Disneyland doesn’t lose much luster in comparison to its younger sibling’s bigger size. I definitely had a similar sensation in that regard, especially in my initial few days’ visits when crowds were minimal. (That being said, a crowded Main Street, U.S.A. isn’t going to vary much between coasts as they are both difficult to navigate during peak hours.) One of the more noticeable exterior differences between the two that’s not tied into structural design is the more notable prevalence of trees at the front of Disneyland’s Main Street, including the town square, which I think exuded a more intimate, accessible appeal than the Magic Kingdom’s more open, blander version of the square. Over time, the inside of WDW’s Main Street, U.S.A. shops has been whittled down to large emporiums with generic merchandising that all flow together. Sure the stores have some thematic qualities, but for the large part, when inside you feel like you’re in Downtown Disney. Disneyland has stayed consistent and true to its original conception more effectively, maintaining store individuality and many of the original shops that have since departed the WDW version. This includes the Penny Arcade and the House of Magic, two beloved long-time stops along Main Street, U.S.A. that harken back to that bygone era. WDW has instead chosen to expand its plush toy displays! Disneyland’s Main Street Cinema is actually a cinema, whereas WDW’s has hosted a multitude of shops. This is an unfortunate use of the space, especially with such cool architecture outside and the obvious historical connection with Disney’s cinematic oeuvre. The same can be said about the Exposition Hall, which once hosted The Walt Disney Story but is now mostly a retail facility with a small theatre in the back. Sigh. I think fans would be more endeared by the concept ofMain Street, U.S.A. if there was more inside the walls than just merchandise or high priced collectibles. Both Main Streets host their fair share of eateries and a good assortment of quick foods whether it be an ice cream cone, a muffin or even a corn dog. The restaurants are pretty standard fare and have never been incredibly appealing to me. I didn't find many startling differences for food on Main Street in either park, though my curiosity was piqued by the Carnation Cafe in Disneyland which has a nice, affordable menu. Alas, long lines prevented me from ever sticking a fork in their meatloaf stack! Of course, the parks share many of the same core values. The sly concept of Main Street, U.S.A. acting as the opening credits of a movie works in both parks, with the posters under the train station and the references to Imagineers (or the “filmmakers”) in the windows above the shops. The train stations, albeit of different design, still sit proudly at the very front of the park, whisking passengers off to the other lands. The transportation, like the trolley or horse-drawn carriages , carries guests to the ends of Main Street, U.S.A. Both parks have street entertainment that takes the theme of the land one step further. These shared concepts all help make the experience of visiting either Main Street, U.S.A. in Disneyland or the Magic Kingdom quite similar and possibly one of the closest duplications of such between any of the parks’ lands. How amazing the foresight to create a Main Street, U.S.A. based on an era that had only been some 50 years prior and thus experienced by not only the Disneyland’s namesakes (Walt and Roy) but also some of its Imagineers. Yet more than 50 years since Disneyland’s opening, that era is equally as cherished even as there remains very few who ever walked down such a main street in America. Despite the architectural and practical changes to the main street concept in our neighborhoods over the years, we still have an affinity for the version that Walt captured at the fore of his park. It’s almost as if he truly recognized how timeless the turn of the 19th century would be this many years later. Or maybe Walt himself has helped us all appreciate that architecture and history because of his own homage to it! But perhaps most importantly, Walt and his Imagineers came up with a wildly incongruent concept, a turn-of-the-century, middle-American main street leading up to a fantastical, medieval castle, and made it an essential part of the theme parks' genius. You could shift around most of the other lands (except for Fantasyland) or reallocate attractions within the lands, as Walt Disney World did in some cases from the Disneyland layout, and still retain the ideology of the theme park. But neither Disneyland nor the Magic Kingdom would be the same if Main Street, U.S.A. were removed or shuttled to another part of the park. Disney would resurrect the concept for Disney-MGM Studios but for the most part attempted different opening formats for the rest of its secondary theme parks, to varying degrees of success, both practically and aesthetically. But that’s a topic for another day! Main Street USA - All Yours! Here's an appetizer for our upcoming two-part feature on Main Street, U.S.A. I was perusing the internets for good pictures of the famous road(s) of Disneyland and Disney World and found this. Tim Devine, the man behind The Magic in Pixels, is an excellent photographer and a major contributor to the wonderful photography in Celebrations Magazine. Here's a shot from Tim's flickr feed.